Have you heard of Jeff Bezos’ “two-pizza rule”? 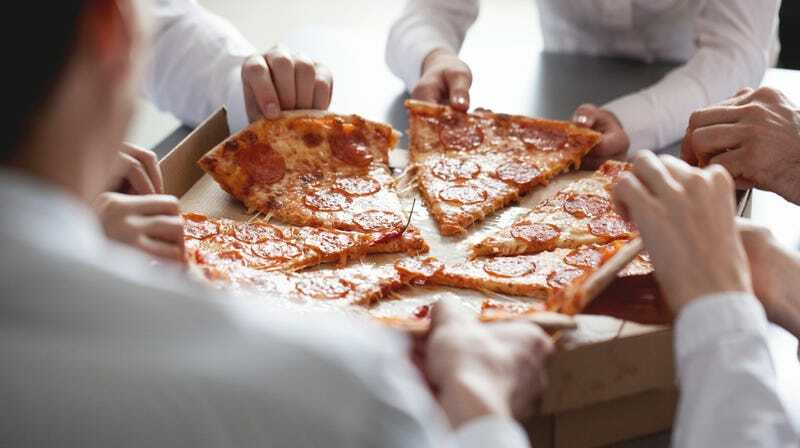 It posits that if two pizzas aren’t sufficient to feed your entire meeting, there are too many people in that meeting. Fair enough; no one likes crowded meetings where three-quarters of the room is staring at the clock or covertly playing Bejeweled instead of doing their actual jobs. Discussion of Bezos’ two-pizza rule in The Takeout’s morning meeting—head count, four—led us down a garden path today: Is pizza really the best food to serve at meetings? Almost everyone likes pizza, and it’s simple to order and distribute. It’s also relatively cheap, and doesn’t necessitate utensils. Pizza as a meeting food has a lot going for it. But it is not immune from criticism. When I worked at a newspaper, someone or other in the newsroom ordered pizza seemingly every few days. I always partook, of course, because hey, it’s free pizza and I’m a young, broke reporter, but the pizza eventually became repetitive. Pizza is a food that most people consume outside of work fairly regularly, so combine that with its ubiquity in offices, and it begins to feel like one’s weekly diet is half pizza. We wondered if there isn’t a better meeting food. To qualify as a reasonable meeting culinary option, the item should be easily ordered, delivered, and distributed; not too messy or fussy; not divisive in terms of its flavor; and not prohibitively expensive. In a perfect world, I’d love to eat delicious sushi at every meeting, but that can be pricey, and fish smell in an office is generally unwelcome. The Takeout staff tossed out other ideas: Sandwiches! Too much individual ordering. Bagel and cream cheese bar! Not bad, but not much protein there. Mac and cheese? Hey, that could work. Mac and cheese can be ordered in large quantities for relatively cheap. It’s a crowd-pleaser. It can be ordered vegetarian or with optional meat add-ins. It comes in a few flavors. It’s filling. The idea of mac-and-cheese meetings is rather appealing. Then again, it’s heavy—uh oh, mid-meeting nap approaching—and requires serving and eating utensils. So, not perfect, but still damn intriguing. Alright, commenters, what perfect meeting food are we missing? Oh and if you could get those suggestions in before our 3:30 Central editorial meeting, that would be greeeaaaat.